DATA! DATA! DATA! We love data and that's why we were reading through a recent report from the Real Estate Center at Texas A&M University about the market for homes in Temple TX. INTEREST RATES are still fantastically low at 4 to 4.5% or less for a 30 year fixed rate loan. We remember the days when interest rates were in the 15% range!! Yes, you read that right! Be happy that you weren't trying to purchase a home in the mid 1980's! Here's a graph of mortgage interest rates through the years. YES rates are at historic lows! THE MOST POPULAR PRICE RANGES in the Temple area have changed since 2014. In 2014, the most popular price range for homes was $100,000 to $149,900 which was almost 39% of all homes sold. In 2015, this same range was only 34% of the total homes sold in the Temple Texas area, which is a 5% loss of sales in this range. In 2015, the range for $150,000 to $199,900 went from 23% of total sales in 2014, to 28% of sales in 2015. This 5% change could be buyers moving up to a higher priced home or new residents purchasing in the market. 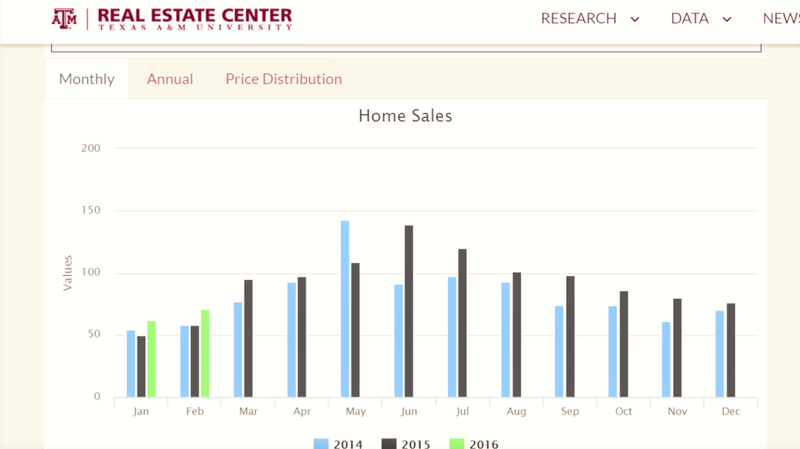 TOTAL HOME SALES FOR 2016 are already outpacing sales for the first two months of 2014 and 2015. The Take Away: In Temple Texas, interest rates remain low, home sales are healthy, the most popular sales price for homes is between $100,000 and $149,900, with increases this year in the $149,900-$199,900 range. The costs of building new homes for sale in Temple continue to increase.